Many people only use dice when playing packaged board games. However, there are some excellent dice games for kids that use only a pair of dice and a piece of paper for score keeping. Dice games are versatile as they can be played with any number of players, on the floor or table, or in the car, and with people of any age. Dice games teach numbers and counting to little kids and mentally adding numbers to older kids. Dice games introduce kids to strategic thinking and planning. 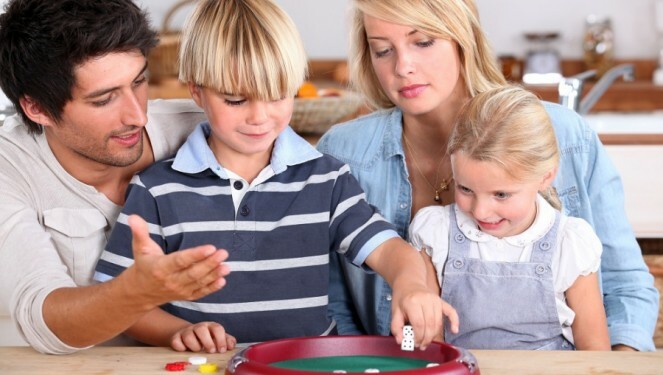 Dice games teach social skills such as taking turns and winning and losing gracefully. Dice games are portable as you can always find room for a few dice in the glove box of your car, a handbag, pocket, or backpack. Dice are inexpensive because dice are cheap and readily available in old table games and in discount and thrift stores. Our collection of dice games for kids includes information about skills developed, just in case you need this information. However, remember that dice games are not usually played to educate, but to have fun! 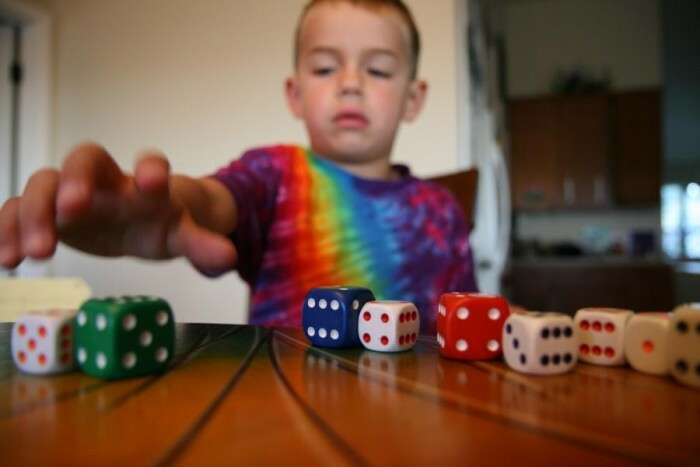 Before we show you our collection of dice games for kids, we suggest you read the following tips for ways to utilize your dice, store them, and have some control over the games kids play. Collect small containers, such as empty spice bottles and pill bottles, and any small plastic food containers with lids for storing dice. 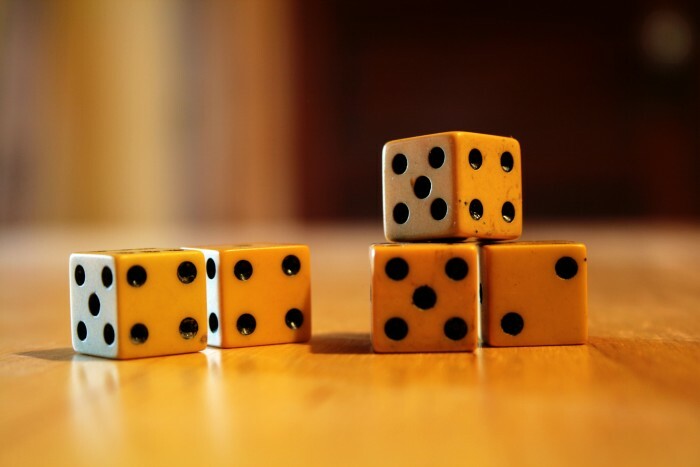 Use plastic cups and coffee mugs to shake and throw dice. Use a piece of felt to cover the playing surface to decrease the noise level during dice games. Create individual dice games for traveling or a classroom by placing dice and directions in re-sealable plastic bags or small, lidded containers. For all of our dice games for kids, you will need pencil and paper for keeping score, a shaker for the dice, and a flat surface. “Knock Out” is a very simple game, using just two dice. As soon as a child can recognize their written numbers, they can play this game. Object of the game: To avoid throwing certain scores and being knocked out of the game. Each player chooses a “knock out number” – either 6, 7, 8, or 9. More than one player can choose the same number. Players take turns throwing both dice, once each turn. Add the number of both dice for the score. If a player throws a 6, 7, or 8, they are knocked out of the game until the next round. Decide before the game a score to be reached for a win. 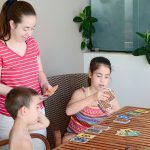 A good game for introducing your kids to the fun of dice games, this easy-to-learn game is one that is very popular with kids. It is sure to become a family favorite! Skills learned: Number recognition, place value, and strategic thinking. Directions for play: Each player takes a turn rolling the dice and placing them in order to make the highest number possible. For example, if a player throws a two and a three, they have 23. A player who throws a six and a four would win the round as they have the higher number. After each throw, a player challenges the next player, “Beat that!” Play this game in rounds, assigning a winner to each round. Try making the smallest number possible. Use three dice for play. Instead of playing in rounds, set a score, such as 500, players must reach to win the game. ”Catch Up” is a great game for groups of children as you need at least four and up to eight kids to play. If you have more than eight kids, split them into groups of four to eight players. Large families and teachers will find this game effective. You will need counters or small toys for each child. Object of the game: To be the first player to win three counters. Players sit in a circle around a table or on the floor with the oldest and the youngest players across from one another. Divide the dice so that these two players each have one. Put the counters in the middle of the circle. Note: The chant is marked with / showing every two beats. Roll now!/Slap clap!/What have you got?/Slap clap! Must you pass?/Slap clap!/Hope not!/Slap clap! The chant is repeated as play continues. The players roll the dice, hoping for anything but a six. If it is six, players must pass the die to the player on their left and take up the chant. A child wins the round when he is still in possession of a die and receives another from the player on his right. The winner of the round collects a counter and the first to collect 3 counters wins. For older children, increase the speed of the chant. For groups of 6 or 8 players, you may wish to increase the passing roll to two numbers – say a 5 and a 6, as this speeds the game up quite considerably. A well-known and easy to learn dice game, “Going to Boston “gives children plenty of adding practice. Roll the dice and keep the highest. Roll the remaining dice and again set aside the highest. Roll the last die, and add up your total. Write down your score. If a player roils the highest total for a round, they win the round. Keep score and the player who wins the most turns wins the game. Keep totaling each player’s score and the player who reaches 500 points first wins. Substitute specialty dice with higher numbers. Have older children multiply the dice to get their score. Use more than three dice. Here is a very simple game of sequences or runs. Each player takes a turn rolling the dice and looking for runs starting with (1-2, 1-2-3, and so on). Each dice part of the run scores five points. A player can only have one run in each roll. The first who reaches 100 points is the winner. Player throws six dice and gets the numbers 1, 4, 2, 1, 3, and 2. The following sequences can be scored: 1, 2 (10 points) or 1, 2, 3, 4 (20 points). The hand is worth 30 points. Player throws six dice and gets the numbers 1, 4, 6, 6, 3, 3. No sequences can be formed, so no score is recorded. Have players multiply the dice to get their score. The first player rolls all five dice. If any 2s or 5s are rolled, no points are scored for this throw. If no 2s or 5s are rolled, add up the total of the dice and write it down. The player sets aside any 2s and 5s, and throws the remaining dice. Again, if any 2s or 5s are thrown, no points are scored. If there are no 2’s or 5s, add the total to the previous score. Continue in this way until all the dice are “Stuck in the Mud.” After the score is totaled, play passes to the left. Agree a number of rounds – five works well – and total up the score. This dice game is simple and fun, which means it is popular. Players take turns rolling all five dice and scoring for three-of-a-kind or better. If a player only has two-of-a-kind, they may re-throw the remaining dice in an attempt to improve the matching dice values. If no matching numbers are rolled, a player scores 0. Set the number of rounds for the game and the player with the highest total score at the end of a game is the winner. 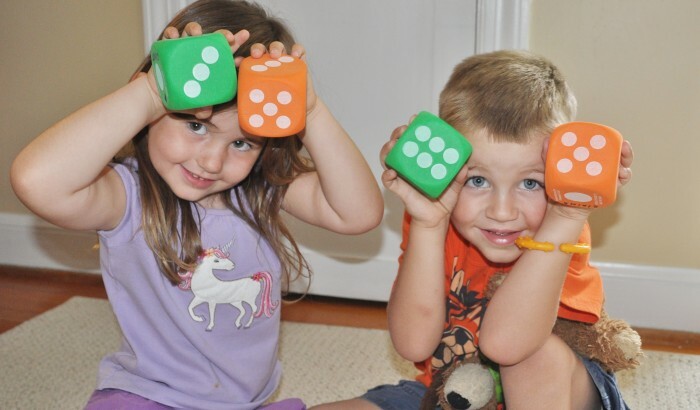 For older children, have them try multiplying the dice together to get their score. This easy game works well for young children as soon as they can recognize the number of spots on dice and count to twelve. Choose the first player with a dice throw; the player with the lowest total going first. The first player throws both dice, hoping to throw a 1. Players then take turns (in a clockwise direction) trying to throw a 1. On the next round, those players who threw throw a 1 will try to throw a 2. Any player who did not throw a 1 in the first round will try again this round. Players can do so by throwing a 2 or two 1s. Play continues round-by-round with players trying to throw all the numbers from 1 to 12 in sequence. Players may count the spots on just one die or on both dice added together. For example, throwing a 3 and a 6 could be counted as 3, 6, or 9. The first player to go “Round the Clock” – throw all the numbers from 1 to 12 in order – wins the game. Variation: A player can keep throwing the dice during their turn until they fail to get the number for which they are trying. Even though the directions make this game sound easy, unless you are good at throwing 1s, this game may be hard for to play. The game is called “Pig” because the first player “hogs” the dice in an effort to win the game. Have the players throw the die to determine order of play. The lowest roll goes first. The player loses all points for the turn when a 1 is rolled. If the first player gets to 100 points on their first turn, the other player(s) may take their turn to try to achieve a better score. 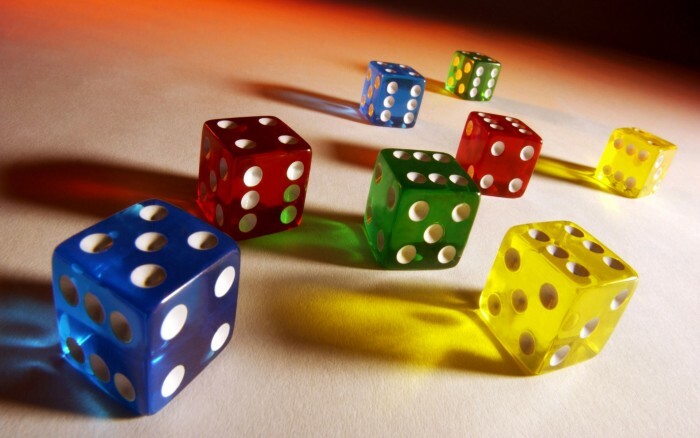 Dice games provide fun for everyone, from very young children to the elderly. Additionally, some families enjoy collecting dice, which can be found in old table games at garage sales, at discount stores, and in educational supply catalogues. Try all of our dice games for kids and have fun! Wonderful games! Thank you for sharing. Will use these with my students for end of year fun games.